Start Taking Steps Towards Your Goal This Year! Your Dream Starts With You! Taking the first or the next step while pursuing any dream can be daunting. There is no playbook for success other than the one we create for ourselves. However, there are resources of the tried and true that can guide our decision-making and help us have the courage to listen to our inner voice. Join us for connecting with new and old friends, a continental breakfast, and a lively discussion facilitated by The Women’s Center’s CEO, Shirley Clark, with Elana Fine, COO VWG Wealth Management and former Executive Director of University of Maryland’s Dingman Center for Entrepreneurship, and Krista Woods, Founder of GloveStix, LLC, on how starting the journey with creativity, passion, courage, and determination can lead to personal and professional success. Elana Fine is the Chief Operating Officer of VWG Wealth Management, an adjunct faculty member at the Smith School of Business, and co-host of the podcast, Bootstrapped. She has been listed as a Tech Titan by Washingtonian Magazine, a “Power Women in Tech” by Tech Bisnow, and one of “50 On Fire” by DC Inno. Krista Woods invented GloveStix, an odor-killing solution for athletic gear. Since then, she founded GloveStix, LLC, won a $150K deal on the hit show Shark Tank, and has been named part of the “Power 100” by the Washington Business Journal. She has appeared on the Today Show and QVC and is named one of the top small businesses in America. Join us for this very special Continental Connections Professional Development Event! Our Annual Leadership Conference always creates a great energy of women connecting, educating, and becoming empowered. Instead of waiting another year, we want to keep that energy going with a new ongoing series: Continental Connections. 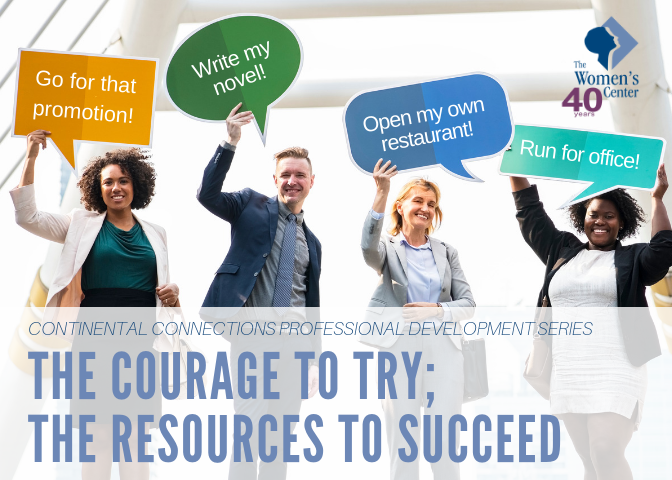 The Continental Connections professional development series is more than a typical networking event. Continental Connections will bring emerging and senior leaders together in a welcoming environment for a continental breakfast. Our events will feature prominent leaders who will share their personal experiences and valuable advice on building a successful career. © 2015 The Women's Center. All Rights Reserved.